While there are very real industries that threaten the shark, another hurdle these animals face is the wrongful fear that humans foster against them. We’re taught that these animals are vicious, bloodthirsty creatures that crave human flesh, but the photo below paints a very different picture of the ocean’s most “fearsome” predator. Reduced to nothing for the sake of soup. In addition to this threat, sharks are being targeted for this fins. 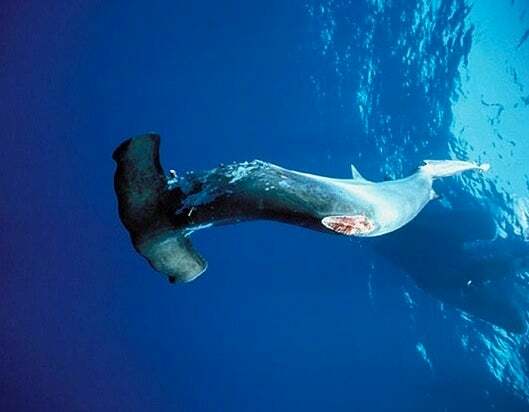 In total, up to 73 million sharks are slaughtered every year … all for the sake of shark fin soup. This dish has long been regarded as a traditional delicacy in China, though in recent years, creative social awareness campaigns have endeavored to change people’s hearts and minds on the issue. In 2014, it was reported that in Guangzhou – the centre of China’s shark fin market – sales had gone down by 82 percent since the previous year! The U.S., meanwhile, has yet to ban the sale and the possession of shark fins – only nine states have taken action on the issue so far. Last August, United Parcel Service (UPS) joined companies such as Philippine Airlines by announcing that it would no longer ship shark fins. It wasn’t long before animal lovers urged FedEx to do the same. Regrettably, however, the company has yet to respond. A little-known fact about sharks is that they could play a key role in the fight against climate change. The worldwide decline in shark populations has meant that the marine species they typically feed on have become overabundant. A thirty-five year study of the coastal northwest Atlantic ecosystem found that as shark numbers dropped, their prey species – became a dominant presence within the ecosystem. Skates and rays feed on small shellfish, and the cownose rays’ consumption habits, in particular, even led to the collapse of a century-old bay scallop fishery. Similar stories have been reported in the Black Sea, the Baltic Sea and the eastern Scotian Shelf. Other animals typically consumed by sharks have ended up eating larger amounts of carbon-storing vegetation, thus limiting the ocean’s ability to offset worldwide carbon emissions. Scientists estimate that when just one percent of the ocean’s carbon-storing vegetation is lost, this results in 460 million tons of carbon being released into the atmosphere every year – the equivalent of the emissions created by 97 million cars! No doubt about it: if we have any chance of slowing the spread of worldwide climate change, sharks need to be saved. The only hope for t his planet is if humans become extinct.